Clash of metal on metal and the thunder of hooves rose in the west. Jared’s head snapped up, scanning the horizon. Whatever he heard, it happened over the rise. CIMMERII tossed her elegant black head. Jared reached a hand, lightly touching the mare’s nose to still the excited blowing. Sliding a hand down her neck, he tangled his hand in her mane and swung lightly onto her broad back. A halfrear before he settled and she spun, charging to join the others who streamed from the camp. Balanced easily within her familiar rhythm, Jared loosed his sword in its scabbard and unslung his pike as she ran. With the sun rising behind them, the leaders paused at the crest of the hill before plunging down to join the raging battle. CIMMERII topped the hill in the midst of the herd and dove without hesitation toward the spears below. Sliding more than she could gallop on such a slope, she skillfully kept her balance to the bottom and with a hard leap, went over the enemies’ front lines to place Jared in the thick of the battle. Wrested from his grasp, his spear fell with the dead and he quickly drew his sword. The sounds of battle cries and beeping . . .
“Jared,” his mother said. “Jared, wake up. It’s time to feed and start grooming.” Orcs don’t beep, he thought, shaking his head before rolling out of his sleeping bag. My name is Jared and a few months ago I rode my first 25 mile endurance ride, the Grasslands Ride. It’s sort of cool. We stayed for two nights and it was really cold during the night, but not as cold as it was at the Lone Star Ride in Bandera, Texas. I rode my main horse, Cimmi. She won 500 pounds of grain. It was very cool. It was good, but it is gone now. I was really tired when I got back from the first loop, 15 miles. I was sorta tired on the second loop. I wasn’t as tired because I wanted to get back. We trotted the whole loop except for when we stopped for water. It was the longest I have ever trotted at one time, 10 miles. The first time I saw Cimmi, I had to get used to her. I wasn’t scared the first time I rode her. She did better than I thought she would. She is bigger than most of my other horses, and faster than them too. So I can beat my mom in races when she challenges me. When we’re riding we race through trees and stuff and we always have a mark to race to like a tree or a turn in the trail. Witness is my other horse. She is a bay mare. I took her to Lone Star Ride in Bandera. She is a very sweet horse. My first endurance ride was 15 miles in six hours. 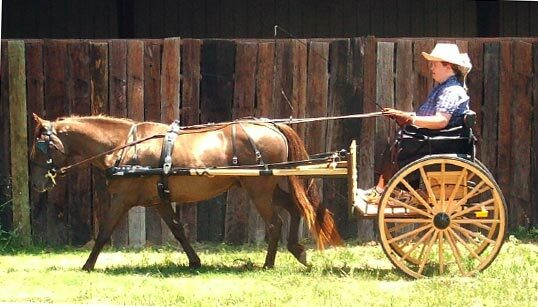 She wouldn’t trot at the trot out, but Mom made her! We had to get there Friday night to ride on Saturday morning. We checked in that night and slept in our sleeping bags in the truck. I liked it a lot too. I trained a lot for this ride! We practiced at the Six-O Ranch. We can ride all day there. My first horse is named Beri, but she isn’t old enough to do endurance yet. I trained her all by myself. It was hard. Her mom is named Dani and she was sold. Beri was really cute when she was first born. She kept stepping on my foot when she was little. So I had to get used to her before I liked her a whole lot. The first time I rode her she didn’t mind that good. She used to bite me on the toe when I was riding. So I had to teach her not to do that. But now she still doesn’t mind that good. Sometimes she is good, but sometimes not. 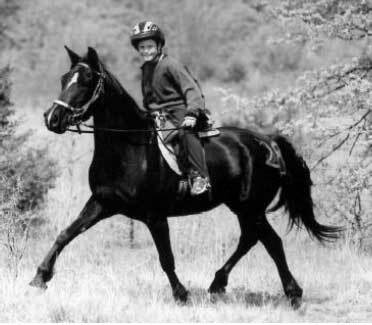 At 8 years old, Jared is a knowledgeable and competent horseman. When we camp, he is helpful with the horses and works hard to do his share. I’m not sure how it happened that he “owns” three of our best mares, but he has a good eye and is quick to claim one that appeals to him. He has been riding WITNESS for several years, trail riding and showing, but when we purchased LA CIMMERII as a broodmare, they bonded almost immediately and have never looked back. Jared and Becky Huffman, of Cleburne, Texas, thank Mindy Cassell for her help with this article.